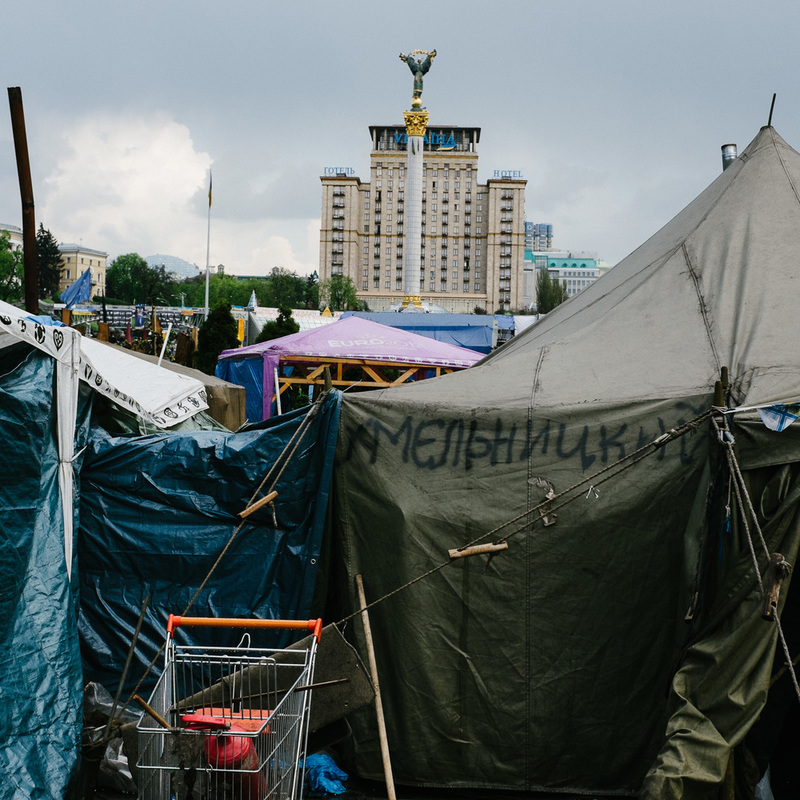 A tent marked with the word ‘Khmelnytskyi’, after a town in west-central Ukraine, pitched on Independence Square, Kiev, in April 2014. Those joining the 'Euromaidan' uprising often organised themselves into groups based around their home towns and cities. 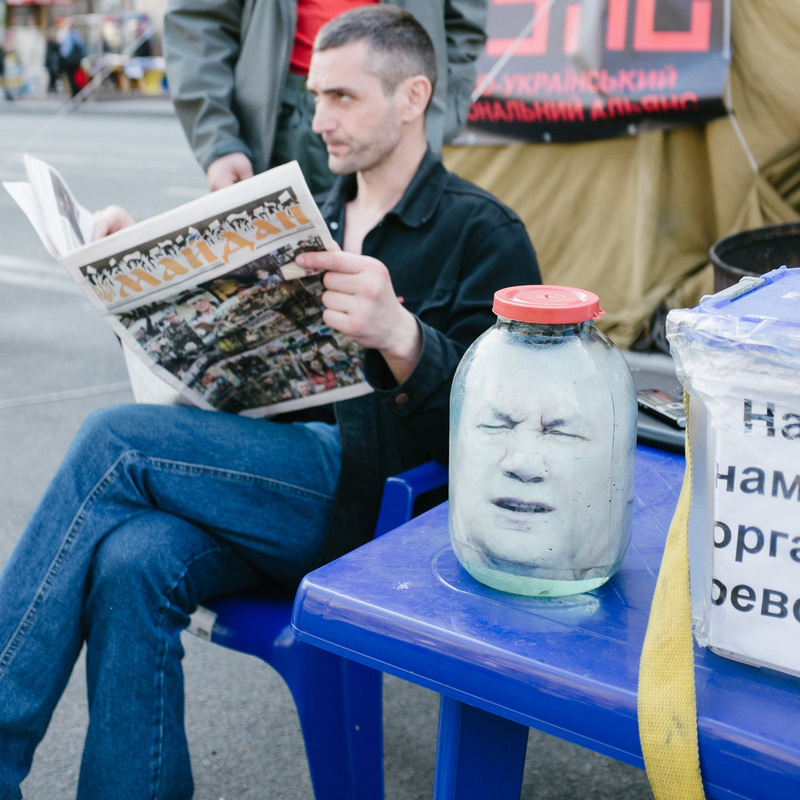 A man reads from a free newspaper reporting on the Euromaidan uprisings next to a replica head of former president Viktor Yanukovych in a sealed jar. The Ukrainian flag draped over tires left over from barricades built on Hrushevskoho Street during the Euromaidan protests, near Kiev's Independence Square. 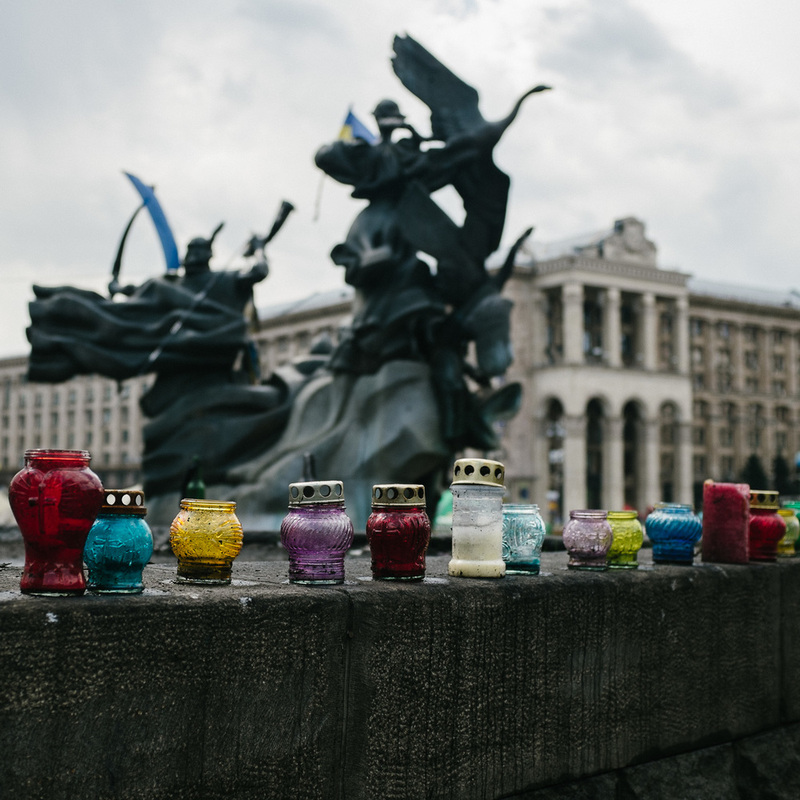 Candles photographed on a wall in Kiev's Independence Square, near to memorials to those killed during the Euromaidan protests. Taras Senik, a Cossack from the Lviv region of Ukraine, photographed on Kiev's Independence Square, April 2014. The burned Trades Unions Building on Kiev's Independence Square. A memorial in Independence Square. A woman looks at a display on the wall of the Cossack encampment built on Kiev's Independence Square, April 2014. A view of a church tent pitched on Kiev's Independence Square. People step around puddles of water after a rain shower on Kiev's Independence Square, April 2014. A street scene in Kiev's Independence Square, April 2014. Sandbags piled in Kiev's Independence Square, April 2014. A display of helmets, shields and other items on Khreshchatyk, the main street running through Kiev's Independence Square, and a site of protest since the beginning of the Euromaidan uprisings in November 2013. 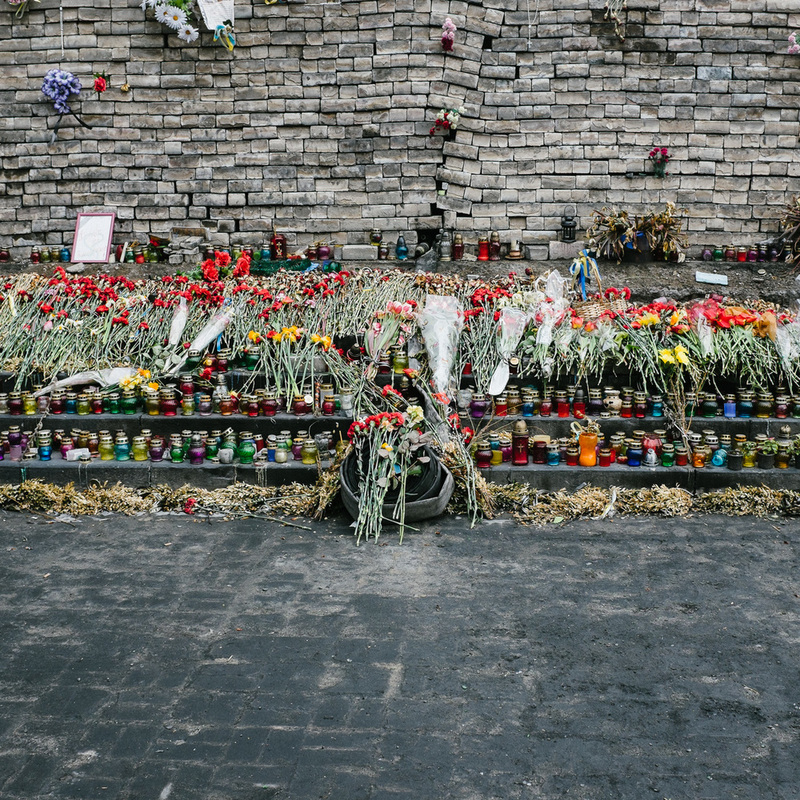 A man prays in front of a memorial to protesters killed in the February 2014 shootings on Kiev's Hrushevskoho Street, off Independence Square, April 2014. A defaced poster of Russian president Vladimir Putin on Kiev's Independence Square, April 2014. Bullet holes mark a lamppost on Kiev's Hrushevskoho Street, off Independence Square. Political cartoons depicting former Ukrainian president Viktor Yanukovych, photographed on Khreshchatyk street, off Independence Square, Kiev. A memorial made from a tire on Kiev's Hrushevskoho Street, off Independence Square. Detail of a memorial on Kiev's Independence Square, April 2014. Empty water bottles outside a tent pitched on Khreshchatyk street, off Kiev's Independence Square, April 2014. A woman smokes overlooking Kiev's Independence Square. Tires in an underpass underneath Independence Square. 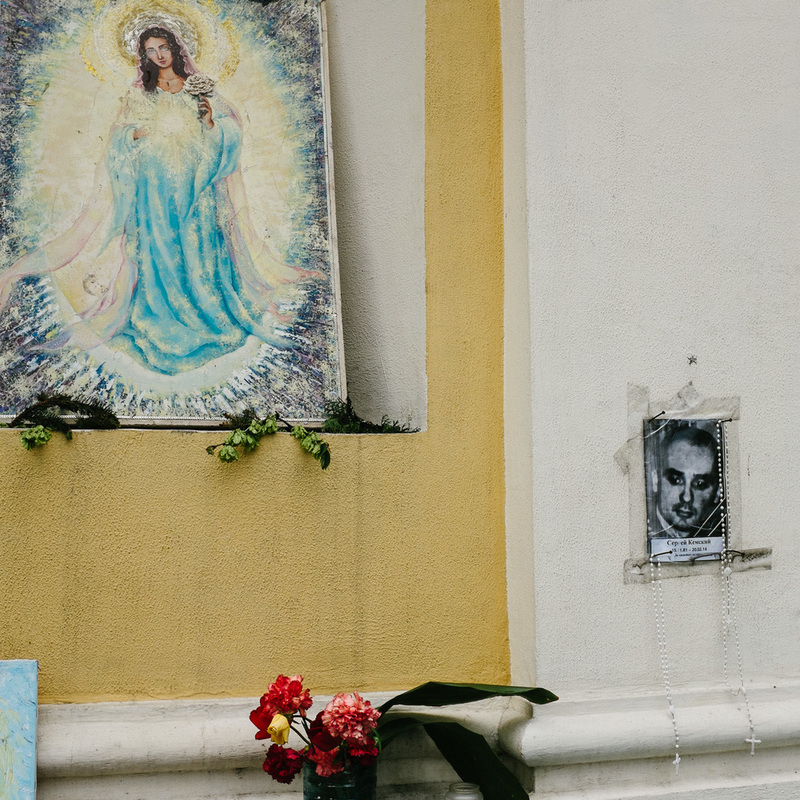 Women walk past a display of pictures of those killed in Ukraine's Euromaidan protests, April 2014. A tourist poses with workers dressed as cartoon characters on Kiev's Independence Square, April 2014. A man sweeps away water after rain in Independence Square, Kiev, April 2014. Part of a gas mask sits on top of a portrait of a man in Kiev's Independence Square, April 2014. Girls dance to a street band playing to crowds on Kiev's Independence Square, April 2014. 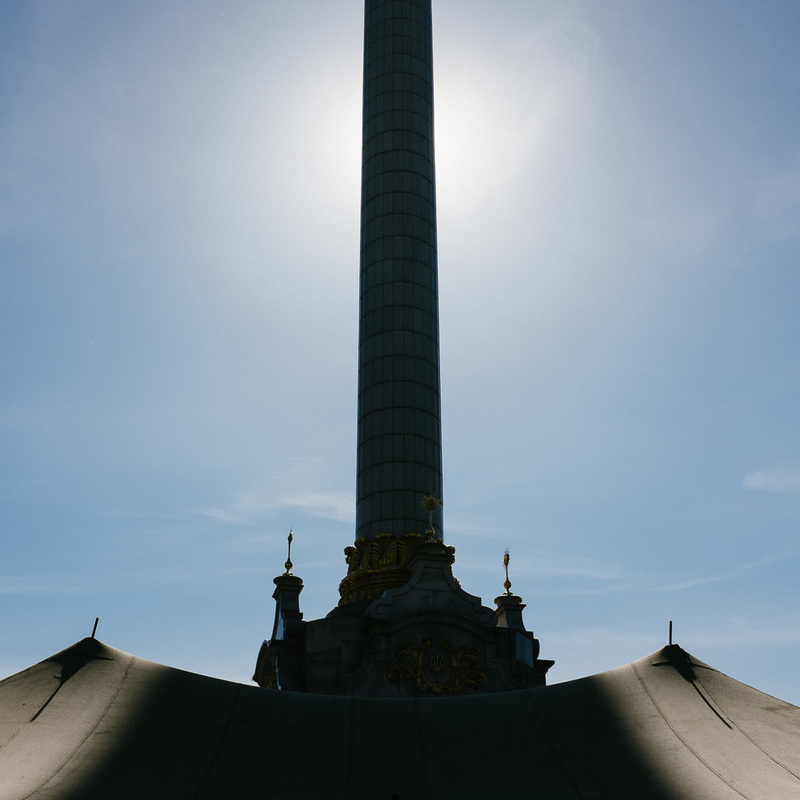 A view over Independence Square, Kiev, April 2014. Tents pitched near the column of the monument to independence in Kiev's Independence Square, April 2014.